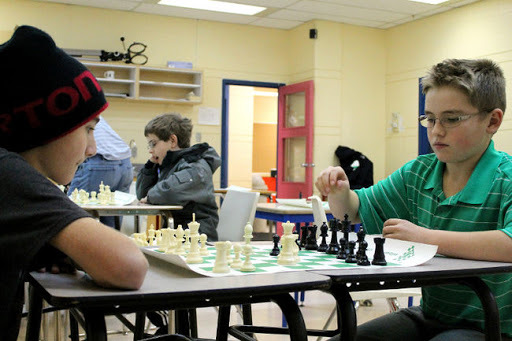 Johnny Burn and Benjamin Farrington, both 11, play a game of chess at the Fort McMurray Chess Club at the YMCA last year. ‘More women play chess in Fort McMurray than in any other part of Alberta. This unique fact about the Fort McMurray Chess Club has gained them the privilege of hosting the 2013 Alberta Chess Championship in July, parallel with the Fort McMurray Open Tournament. The club’s success can be seen as a result of the many hours long-time chess player Jina Burn has volunteered to advocate for the game. Recently nominated to join the board of directors for the Alberta Chess Association, she says she is “very excited” about what is happening with chess locally, and shares her dream to have chess as part of the school curriculum across Alberta and Canada.